Let’s leave partisan vitriol aside of one minute and consider: What if we actually followed this advice? Here’s a little more about the Kid President story. 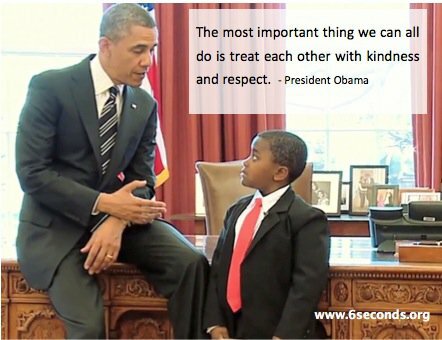 It reminds me of this amazing video from The Dalai Lama Center for Peace — because unfortunately, even when the President of the United States says it’s the most important thing, it’s not enough to simply say, “let’s treat each other with kindness and respect.” If we mean it, we have to learn it. Practice it. Teach it. First to ourselves. Then to others.